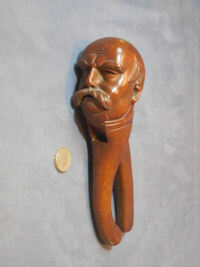 Original, quality late 19th century, Swiss carved "Black Forest" nutcracker in the form of the head of 'Otto Von Bismark' (1815 to 1898) a prominent Prussian Statesman, Prince of Bismark, Duke of Leunburg and First Chancellor of Germany. A super example with a wonderfully detailed head and face and a good colour. Complete and in good and working order. The first we have seen of Bismark. 8.5" x 3" x 2". 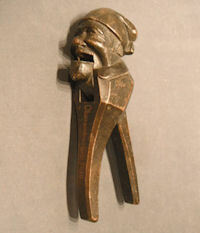 Original, quality 1920's steel nutcrackers in the form of a parrot's head and beak with feather detail to the head. 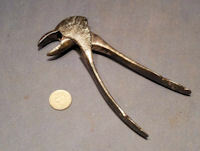 This realistic and most unusal pair of nutcrackers was originally nickel plated of which most has worn away otherwise all is complete and in good and working order. The first we have seen. 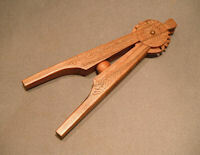 6.5" x 2.5" x 1"
Original, quality pre-war, well carved Eastern European wooden nutcracker, designed to take hazel nuts. Complete and in good and working order. 8" x 2" and 0.75". Other similar may well be available. 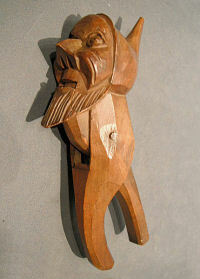 Original, quality pre-war, well carved Eastern European wooden nutcracker, designed to take hazel nuts. Complete and in good and working order. 8" x 2.5" and 1". Other similar may well be available. 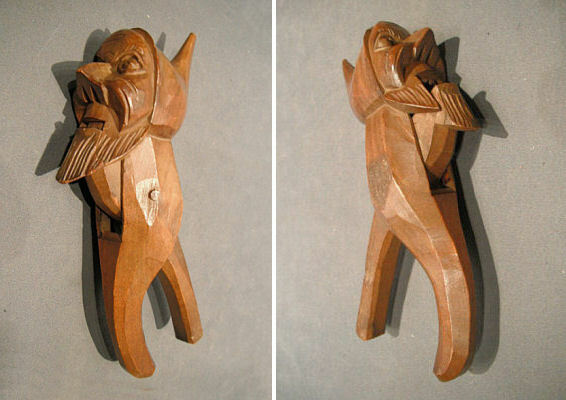 Original, quality, late 19th century, Swiss carved 'Black Forest' nutcracker in the form of the head of a peasant, with a knotted scarf around the head. 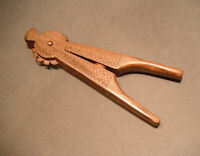 A great colour and condition, complete and in good and working order for smallish nuts. 7" x 3" and 2" wide.